Wow, what happened to me posting anything on Friday? My day just got away from me, and by the time I made it down to the computer, I was just too tired to write up anything worth reading. I’m still trying to figure out this whole school schedule thing and how it works with my sleep patterns and everything else. I’m sure you all understand. Friday morning means up at the crack of dawn It also means I have little interest in making anything too complicate for breakfast. 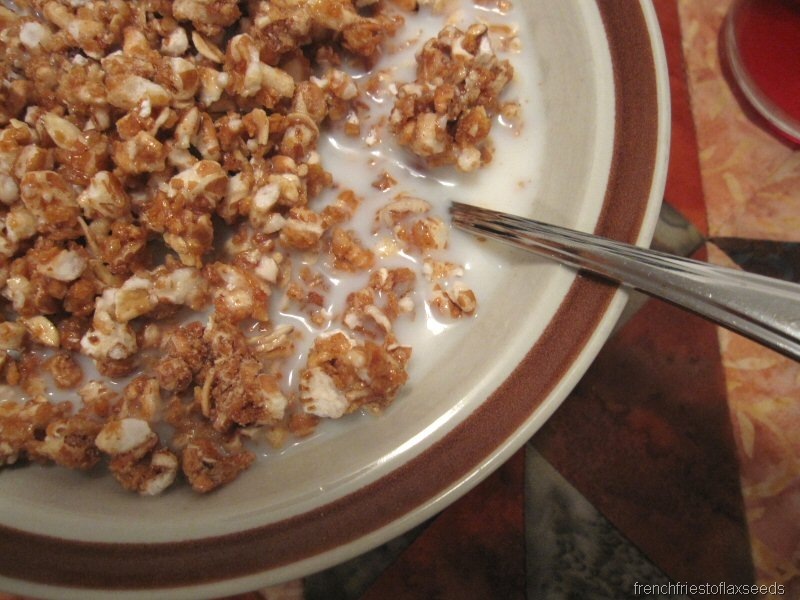 Cereal it was! 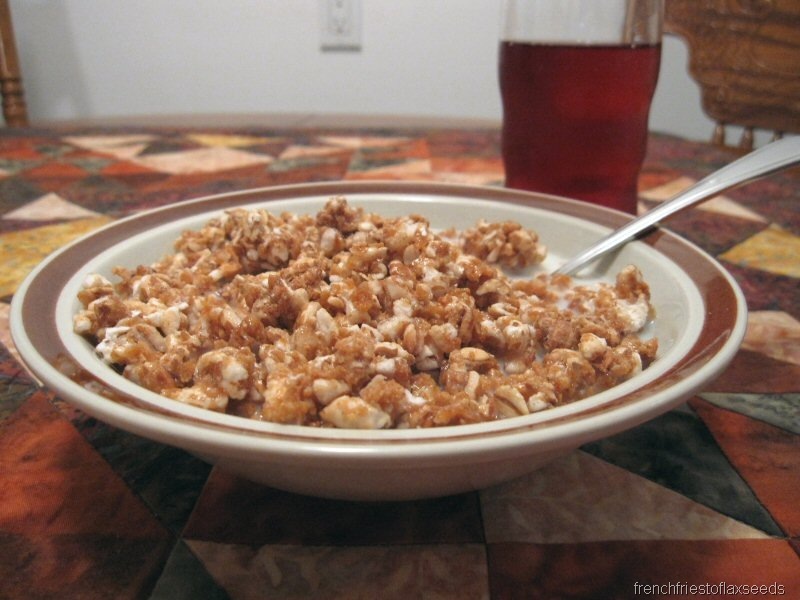 Just a bowl full of Kashi GoLean Crunch and milk. I didn’t even bother trying to doctor it up. 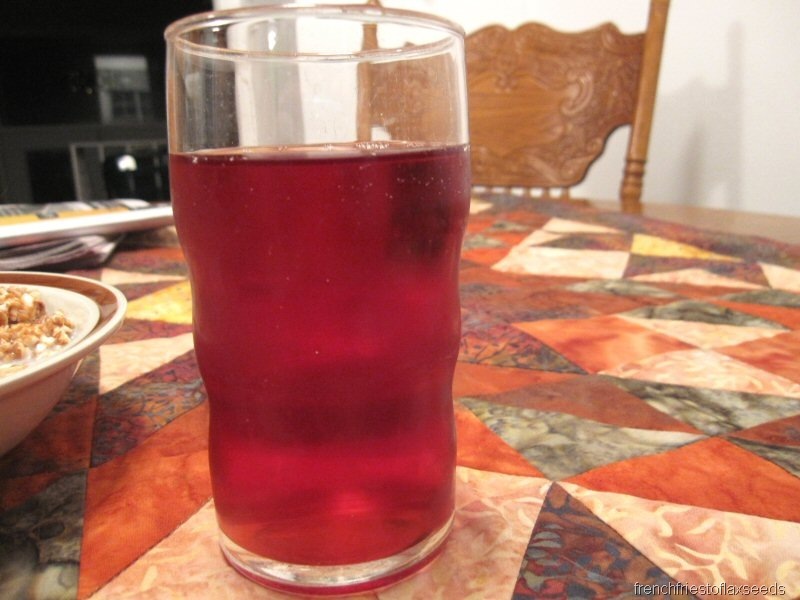 Paired up with the usual glass of cranberry pomegranate juice. 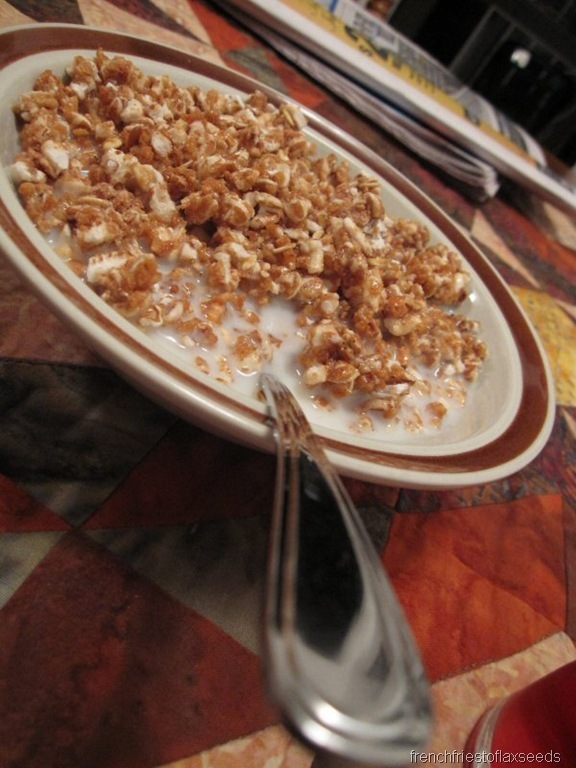 5:30 am definitely requires quick & easy when it comes to breakfast. After an uneventful commute and a thrilling biochemistry lecture on amino acids, I wandered over to one of the many Starbucks on campus to get some caffeine in my system – in the form of an iced green tea latte. 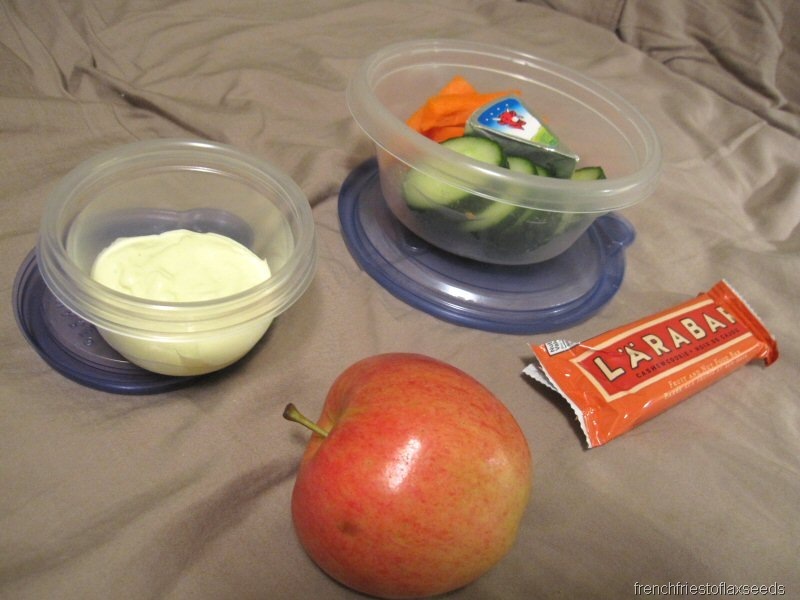 I packed a lunch of sorts to take with me to school as well, since I didn’t know quite how long I’d be there. 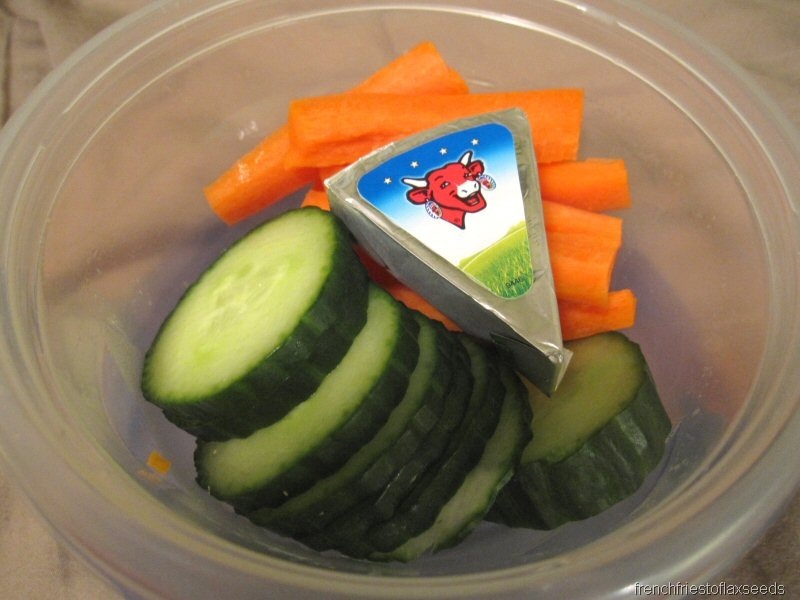 Carrot & cucumber slices with some delicious dill dip, plus a wedge of Laughing Cow. And an apple that I never got around to eating while I was out. I came home for the customary afternoon nap, followed by some camera shy homemade cookies I spent the afternoon searching for jobs and working on some homework. It was all sorts of thrilling! Dinner time rolled around, and since it was take out Friday, we ended up with pizza. I think pizza & Chinese food are the go-to meals for take out nights in this house! Again, we ordered from Pizza Hut, and my dad was nice enough to ask what pizza I wanted. I decided to go with the Chicken Florentine, which was grilled chicken, baby spinach, roasted red pepper, and tomato. I subbed out the tomato for mushrooms though. Yum! As you can see, I had my two slices with a couple of cheesy bread sticks and was perfectly satisfied. At least until evening snack time came around. I sliced up the gala apple I hadn’t eaten at lunch, and dipped the slices in a blob of creamy & delicious peanut butter. And that, my friends, is what happened ‘round here on Friday. Another exciting day in the life of me! I tend to agree with Katie… especially when pizza is involved too! ooooooooo pizzzzzzzzzzzzzzzzzzza!! 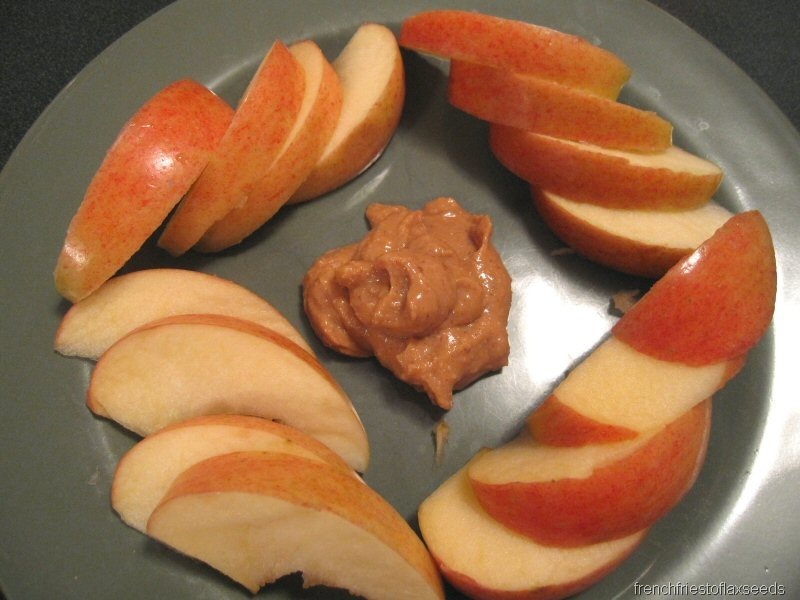 apples and nut butter! love it!! i need more laughing cow in my life! I’ve only had them once or twice! 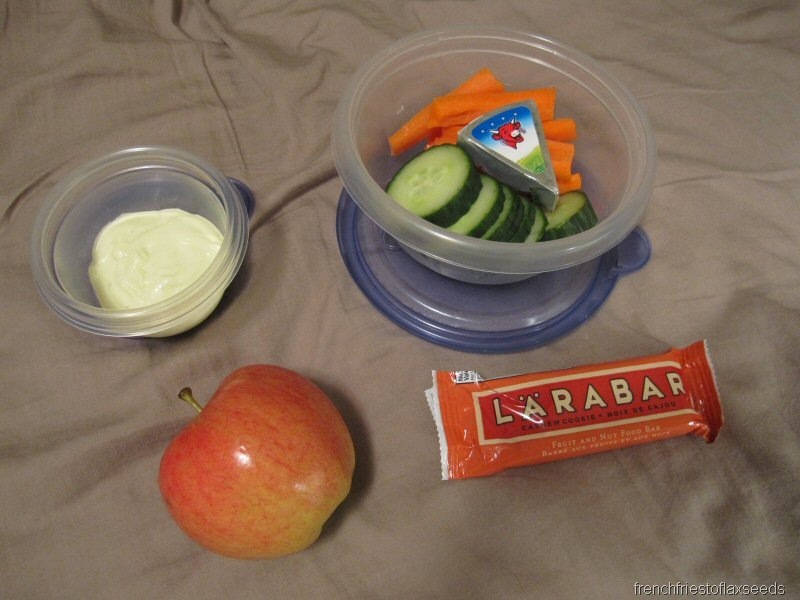 ohhh..you make apple and pb look awesome! School does throw a wrench in blogging doesn’t it?! 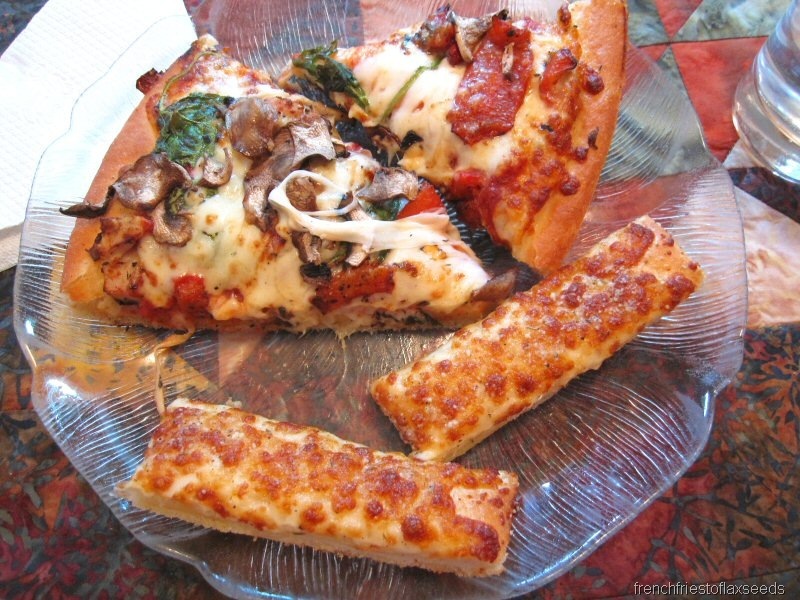 I’m all about that cheesy bread stick – YUM!! 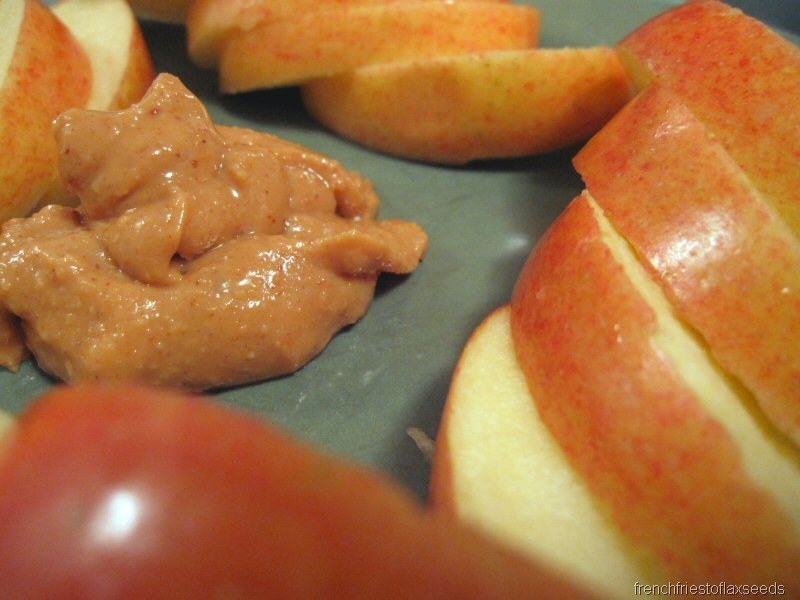 Mmm I love your cut up gala apples with nut butter, such a great snack. Oh, and the pizza looks amazing, and I don’t even like Pizza Hut. I think I’m due for some good pizza soon! omg i love pizza hut! hahaha guilty pleasure of mine! school and blogging is hard especially when time is short, but dont worry we’ll figure it out! 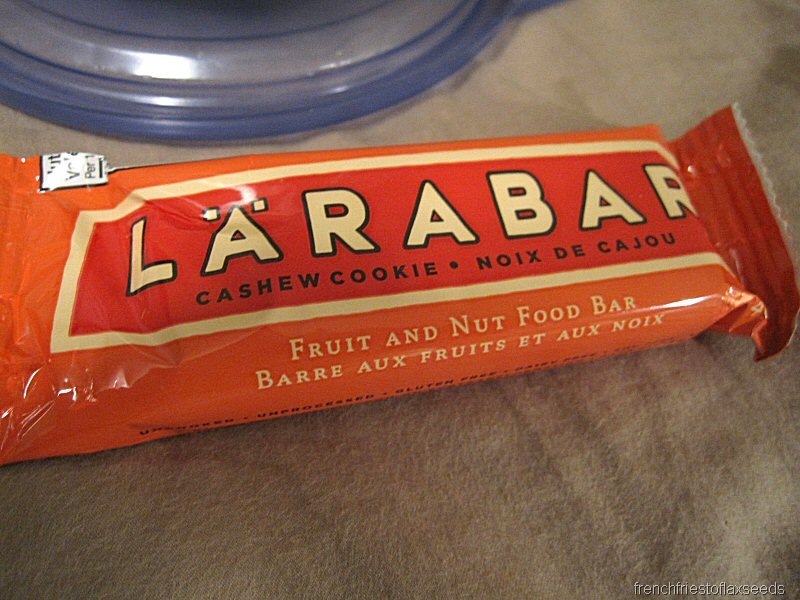 Cashew cookies lara are love!!! 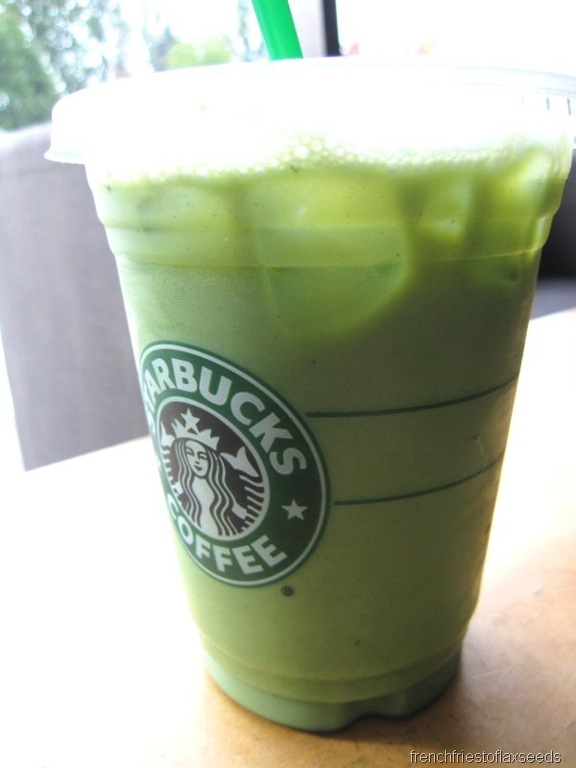 I have never even heard of the iced green tea latte but it look so good!! So green! Green tea lattes are my favourite! I always hated group work when I was in school. I always preferred working on my own and not having to worry about other peoples intentions (or lack there of). how does the iced green tea latte taste? i’ve been wanting to try it! i already tried the green tea frap. do they taste the same? which is better?